“What do you mean, there’s no more flour?” And other kitchen disasters. 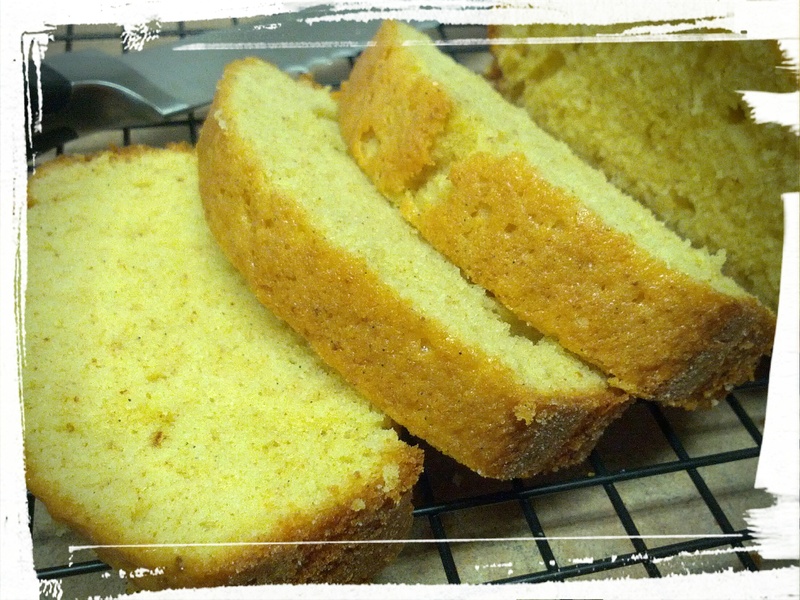 Fragrant, buttery loaf, flecked with vanilla seeds, and redolent of rum! If you follow my blog, you know that I’m part of a bake-a-long group, called Tuesdays with Dorie, and that we’re baking our way through Dorie Greenspan’s latest cookbook, entitled Baking Chez Moi. We bake a new dish twice a month, and this week’s recipe is Brown Butter and Vanilla Weekend Loaf. Of course, because I’m not one to do the whole mise en place (See what I did there? Working in some French words? I guess all those years of French language class in elementary and high school paid off. Vive la…Canada? And the mandatory language lessons! We now interrupt this parenthesis to go back to our primary sentence in 3…2…1), it was inevitable that I would run out of something. I thought it would be the cream, but the DH managed to pick some up for me on the way home. Crisis averted! Or so I thought. So I had browned the butter, scraped the vanilla bean and went to mix it with the sugar when I realize that, um, I’m out of sugar. I had only 1 cup, and the recipe called for 1 1/4. Huh. I actually thought about knocking on a neighbour’s door to ask to borrow a cup of sugar. Except that I live in a condo and don’t have that sort of relationship with my neighbours. Also, the grocery store is down the street (two, technically). But did I want to go out into the bitter, bitter Canadian cold to buy some more sugar and flour? No, I did not. 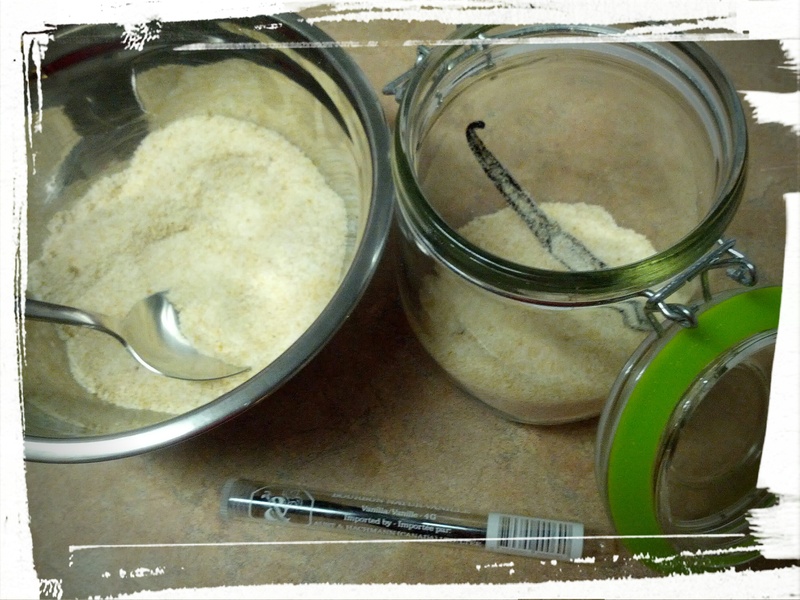 Instead I channelled my inner kitchen diva and looked around my kitchen, and lo and behold, I had brown sugar! They don’t call me the Queen of Substitutions for nothing! So I mixed that in. Waste not, want not, also applies to vanilla. In this case, beans into sugar! 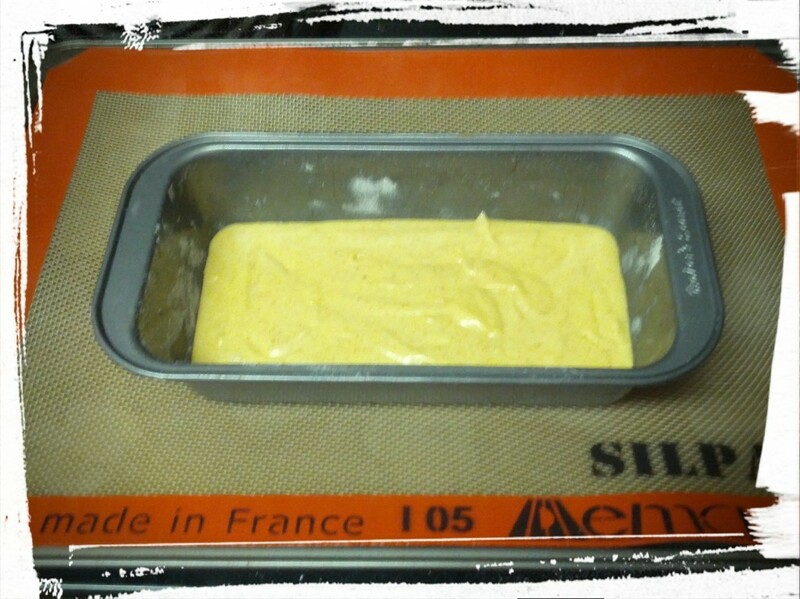 And I finished mixing up the batter, and popped the loaf in the oven. And promptly forgot to set the timer. I had to include this photo. I mean, check out the wording on the silpat sheet! Apropos, oui? At any rate, the loaf baked, and I licked the batter bowl. (The DH *may* have helped.) And oh my gosh, this batter is delicious! The fresh vanilla, the rum, the brown butter…it all melds to create this super yummy flavour! I wish I could capture that flavour in an ice cream. It’d be a hit! When I took the loaf out of the oven (the DH was heading to bed at this point, but hung around long enough to snag a slice. Or two. And a half.) and let it cool, the loaf stuck in the pan a bit. So, note to self and all blog-readers, rice flour is not a good substitute for cake flour when prepping a loaf tin. Just so you know. I ended up cutting out an end and then using a spatula to lift out the rest of the loaf. And then I ate a slice and a half myself! Is delicious. Not as delicious as the batter, though. Seriously, that batter…next time, I’ll just eat the batter. I wonder if I could take the brown butter and rum and vanilla flavours and use them as a base for a custard, and then turn the custard in to ice cream. And then serve that ice cream with super thin slices of this bread, toasted in the oven, biscotti-style. I think that would be the best of both worlds! Oh, and I should note, that this loaf is supposed to be better the next day. I told the DH this as we munched away on our warm, fragrant slices of the loaf. We both sort of laughed. And took another bite. Can you see the flecks of vanilla bean seeds? I feel so gourmet! This entry was posted in Cakes, Cook-a-Longs R Us on January 27, 2015 by Margaret. Melty, melty chocolate. Need I say more? My family has never been one to do that traditional Sunday-night-dinner-with-the-family/pot-roast/ham thingy, as we tend to get together whenever as opposed to a set day. But my sister had this GIANT (and I do mean GIANT) ham that she wanted to cook, and she couldn’t eat it all herself, so she invited the whole family over for Sunday dinner. The DH, a meat-a-tarian living with a vegetarian (me) who is the primary cook in the household, was very happy! Especially when my sis sent us home with several containers of ham leftovers. (Have I mentioned how GIANT the ham was?) At any rate, my contribution to the dinner was dessert, and although I had wanted to make the latest Bake-a-Long recipe, I didn’t have one of the key ingredients, and so I made my Back Pocket Chocolate Chip Cookies. Why do I call these Back Pocket Chocolate Chip Cookies? Because it’s a handy recipe to have in your back pocket! You can change up the ingredients (because I’m all about the substitutions), switching the white flour for whole wheat, swapping out the cream cheese for more butter, changing the nuts, cutting out the oats, adding in ground flax…the possibilities go on and on. Cookie batter, that delicious, delicious confection! But enough, with the blathering, let’s make some cookies! Cream the butter, cream cheese, brown sugar, egg, vanilla, and butter flavouring together until fluffy. Mix in the flour, oats, and baking soda. Stir in the walnuts and chocolate chips. Roll into balls and place on a greased cookie tray or a Silpat sheet, flatten slightly, and chill in the fridge for half an hour. Bake in a 350 degree oven for 10-12 minutes, or until tops verrrry lightly browned. Let cool and gobble up. Or bring to a family dinner party, like I did! 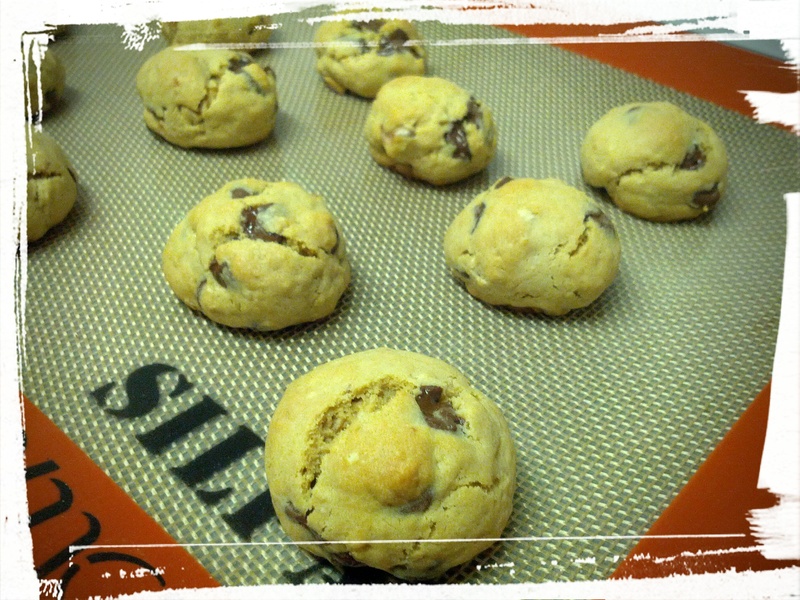 I tried out two things in this recipe that were new to me: using a Silpat sheet, and butter flavouring! I got the Silpat sheet as a Christmas gift, and was very delighted to see it. One always hears of the posh bakers and food bloggers using their Silpats (or their generic cousins), to reduce using of parchment paper and butter when baking cookies and such, so I wanted to see what the fuss was about. Trying out a new kitchen tool! My take on the worthiness of Silpat sheets? They’re nice. They’re useful. They haven’t changed my life. Anyone able to tell me why people rave about them? Let me know in the comments! I also used another new-to-me product in this recipe, butter flavouring. I first read about it on the Southernplate website, and when I came across it in a store, I snapped it up to try. My impression after adding in 1/8 tsp. of the flavouring: butter flavouring? What? In other words, I was not terribly impressed. Perhaps I needed to use more?I generally like to eat pretty wholesomely, and adding in a flavouring made of chemicals is really not my bailiwick, but I thought I’d try something new. If you use butter flavouring, and you like it, let me know why and how to best utilize it! And a final gratuitous melty chocolate pic! 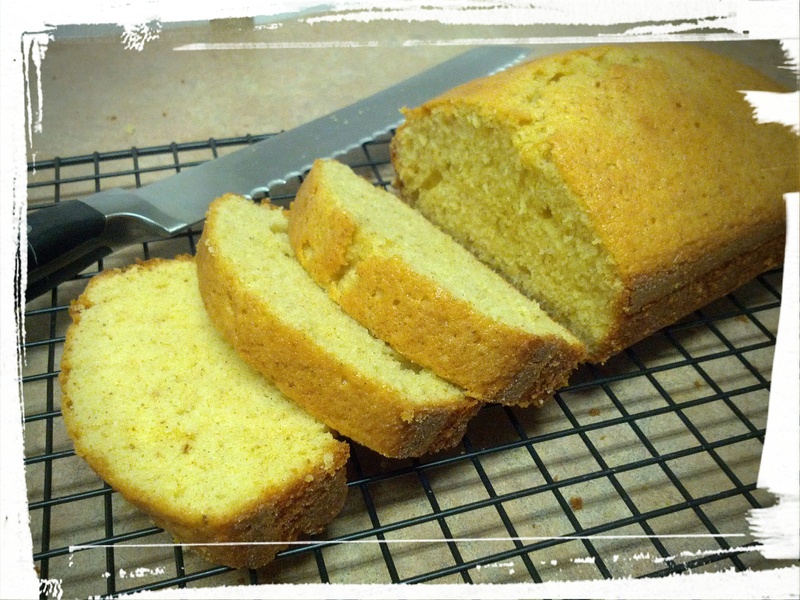 Next Post: More Parisian flair, with a Brown Butter and Vanilla Bean Weekend Loaf! Made on a weekday. Because I don’t stick to your arbitrary baking rules. 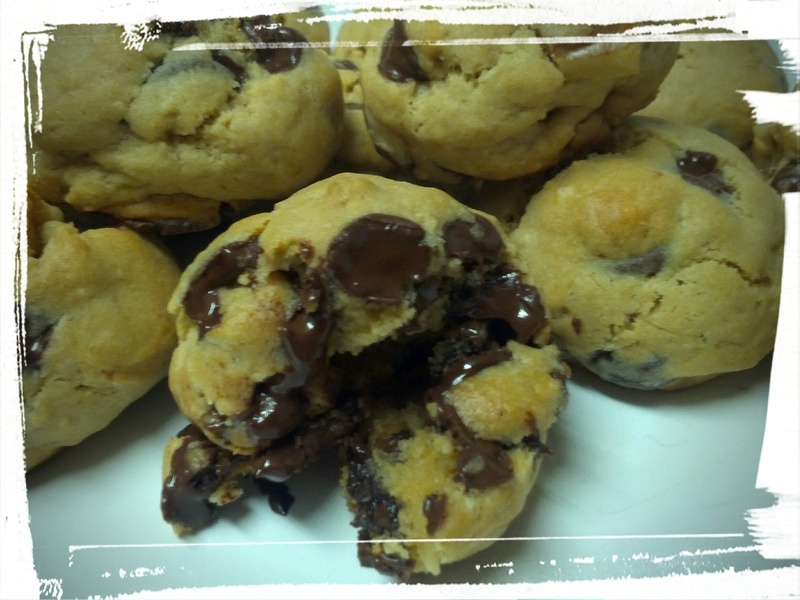 Linking Up at Meal Plan Monday – Cookie Edition! 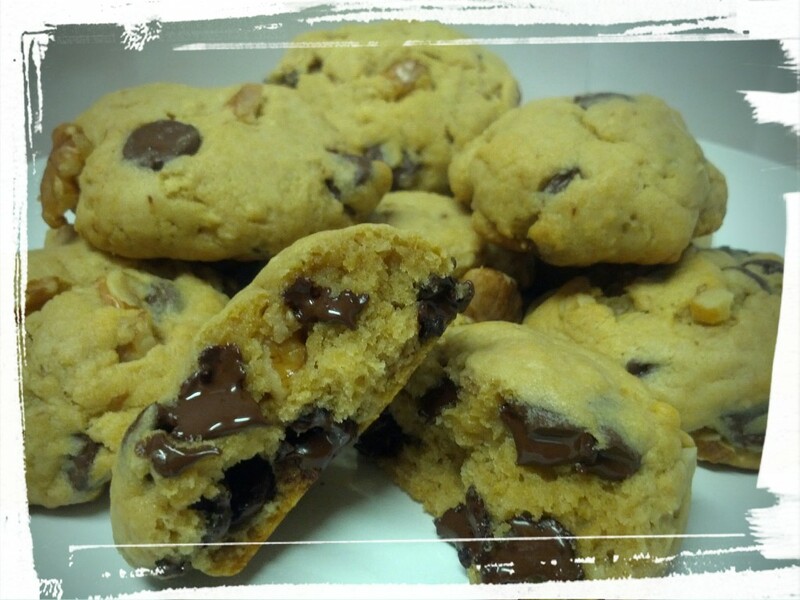 This entry was posted in Cookies on January 26, 2015 by Margaret. Serve in Mason Jars, you hipster you! I’m still on my salad kick, partially because I like salad, and partially because I’m doing penance for my holiday indulgences. Not regretting, mind you, just doing penance. 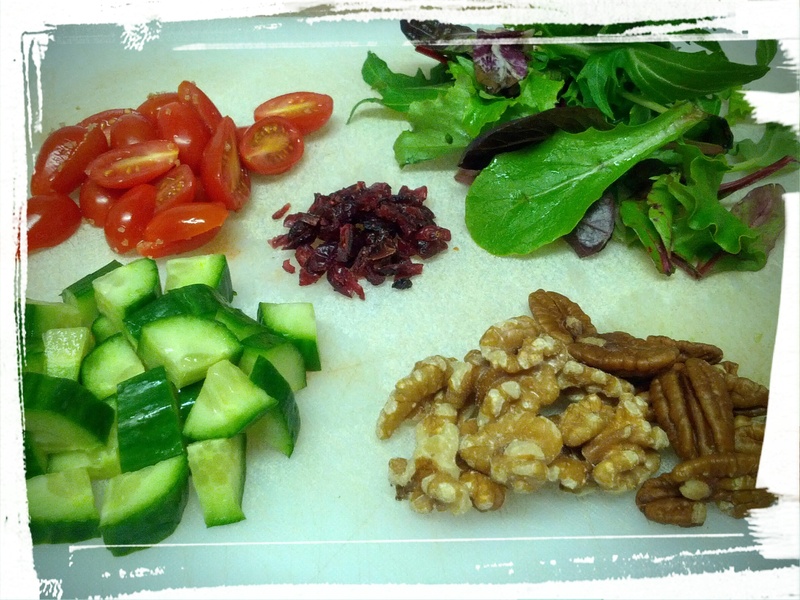 No, I shall never regret that rummy fruitcake…*interruption to drool*…but salad is A Good Thing. Especially for my IBS. Today’s recipe is influenced by the Middle East (*cue belly-dancing music*). The salad contains bulgar (cooked, dried cracked wheat that you merely rehydrate), chickpeas, and olive oil, all lovely Middle Eastern staples. The olive oil in this particular dish is authentically Middle Eastern, as some relatives in the Middle East sent it to me, and let me tell you, it’s so pure, you can actually taste the olives! It’s this lovely dark green colour, with a buttery taste, and a green aroma (this is an actual olive-tasting term — I should know, I googled it). So I had to make a dish that showcased that wonderful flavour. And I had some bulgar in the cabinet, and some cooked chickpeas in the freezer, so…voila! Bulgar Salad with an Olive Oil Dressing! And then I had to layer it in Mason Jars, because it just looks so cute that way. That, or my subconscious is a hipster. Either/or. Want to be a healthy hipster too? Let’s whip up some salad! If you haven’t rehydrated the bulgar, do that now, and let it cool. Chop the cucumber, tomatoes, and cranberries. Roughly chop the nuts and mix together. 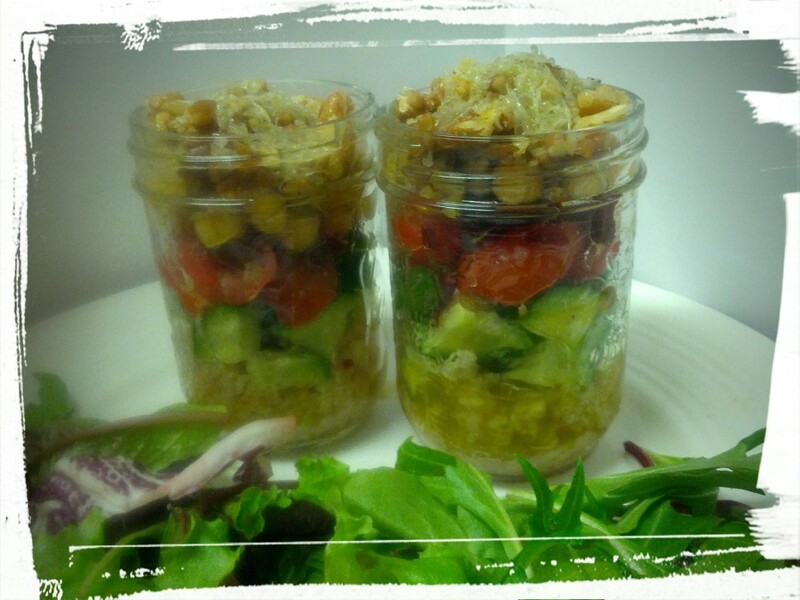 Layer it all in a glass jar, starting with the bulgar. Mix the dressing ingredients up in another jar, and let sit for 5 minutes to half an hour, and then discard the garlic halves. Drizzle the dressing over the top, and screw on the lid. And…healthy hipster lunch is done! Or toss it all in a bowl. It’s tasty either way! The dressing: practically luminous! Also delicious. 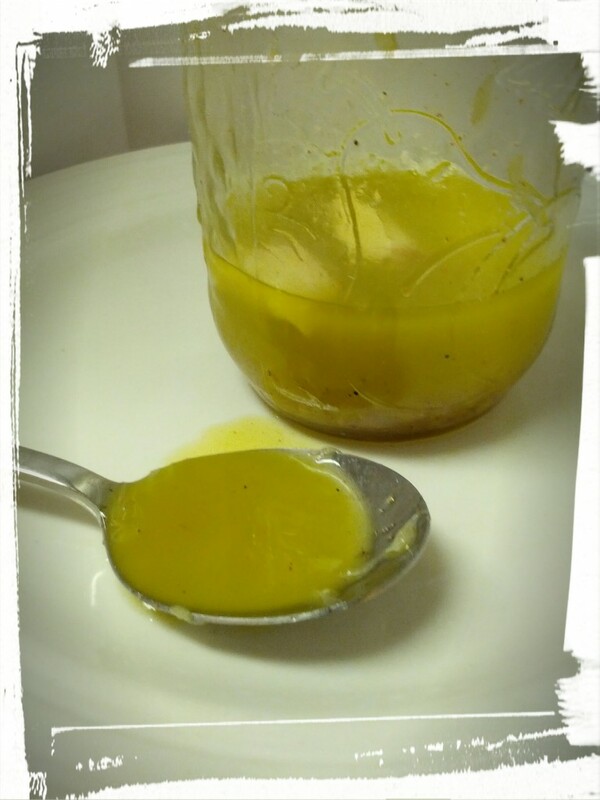 This does make quite a bit of dressing, but hey, olive oil is good for you! Also, if you’re keeping it overnight in the fridge, any extra dressing will be absorbed by the bulgar. If you’re serving it right away, serve on a bed of mesclun greens or lettuce, or else add another 1/2-1 c. rehydrated bulgar. I’ve packed a jar of the salad for the DH’s lunch, as well as one for myself. I’ve also packed some baby greens to serve it on. Now I’m looking forward to lunch tomorrow! What are you having for lunch? Let me know in the comments! Next Post: Memories of Meals Past, or in this case, Bok Choy made tasty. This entry was posted in Salads I Have Known and Loved on January 22, 2015 by Margaret. Like extremely dense and nutty rum-soaked donut holes. More, please! I’m always on the lookout for new and delicious things to make, because a) I love baking and b) I love eating and c) chocolate is my friend. So when a client at my work told me about the Brandy Balls that she always makes around the holiday season, I asked her for the recipe. She very kindly obliged. Shout out to Mrs. M! Isn’t it nice when people share their recipes? Whenever I make a dish using a recipe given to me by someone else, I always think of them. It’s a nice way to live on in people’s memories, you know? I never understand why some people decline a request for a recipe. Totally boggles my mind. I accept it, and I respect it…even as I don’t understand it. (Any insights? Let me know in the comments!) Luckily, the proprietor of the yummy-sounding Brandy Balls was generous and shared her recipe with me, and I’m going to share it (modified, because of course) with you! As we don’t have any brandy in the house, I’m using the last of some delicious Venezuelan rum that was given to the DH and I by one of his oldest and closest friends, and I think that if the friend knew that I was baking with it, he’d be aghast. I gather we were supposed to drink it neat, and savour every drop. Which I did when I first opened it. And when guests came over, they enjoyed it too. And then I used some of it to make Quesillo, and now I used the last for this recipe. I’m just not a rum connoisseur, you know? But I do appreciate the fine flavour that it gives these Rum Balls! Whoo, they’ve got some heady fumes, I tell you what! In addition to swapping the brandy for the rum, I also tossed in some leftover coconut from the Granola Bars I made recently, because I hate wasting food, and I didn’t want to give up precious kitchen space to a container holding only 1/4 c. of shredded coconut. Oh, and I used graham wafer crumbs instead of crushed vanilla wafers, because Mrs. M said that they work just as well. 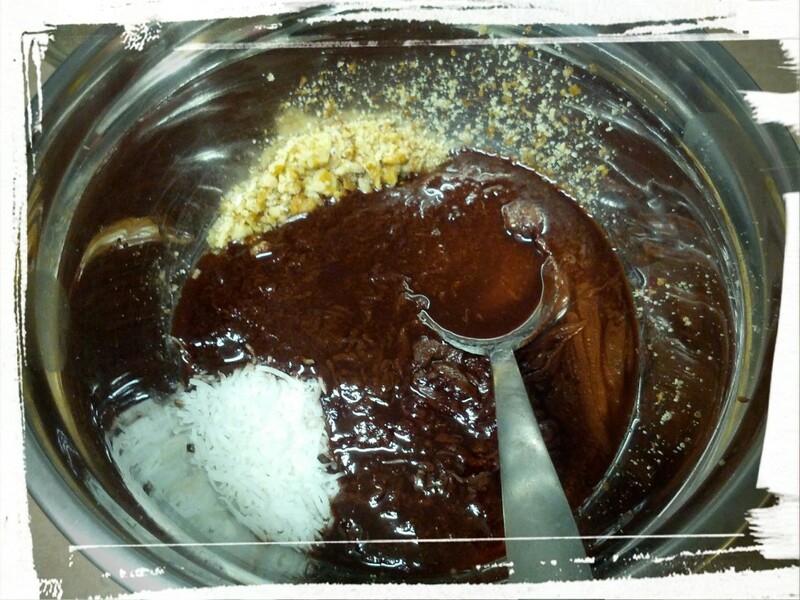 Mixing up the rum and chocolate goodness. Possibly sampling it as well. And then I mixed it all up! Want to mix up some chocolate and rum goodness yourself? Let’s! Crush (or chop) the walnuts into teeny tiny pieces, but not so small that it’s considered ground walnuts. Melt chocolate in microwave, in 15 sec. bursts, stirring in between. When melted, add in sugar, brown rice syrup, and rum, and get mixing! Then add in walnuts and graham cracker crumbs and mix again. Let sit in the fridge if it’s not firm enough to roll into balls. 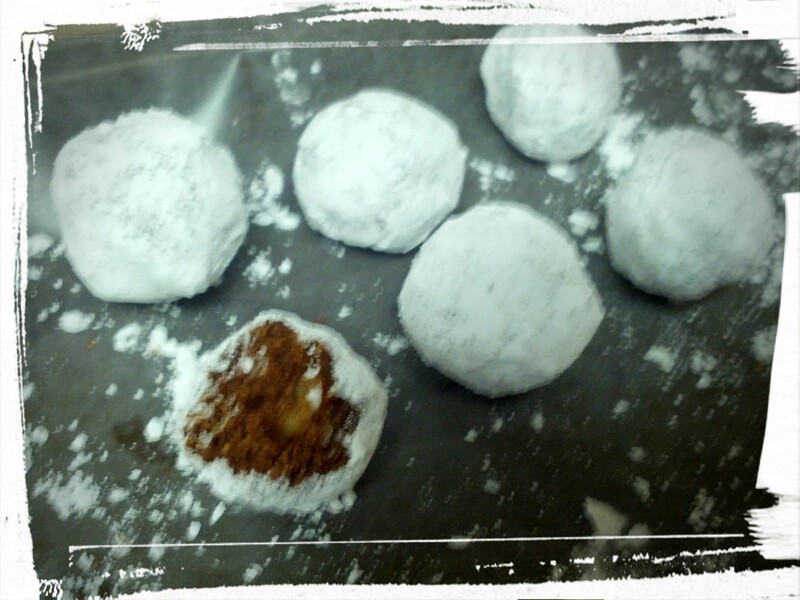 Then, roll into balls, and then roll those balls in icing sugar. And bam, done! Makes 4 1/2 doz. balls, or you know, 4 doz. plus taste test samples for the cook. 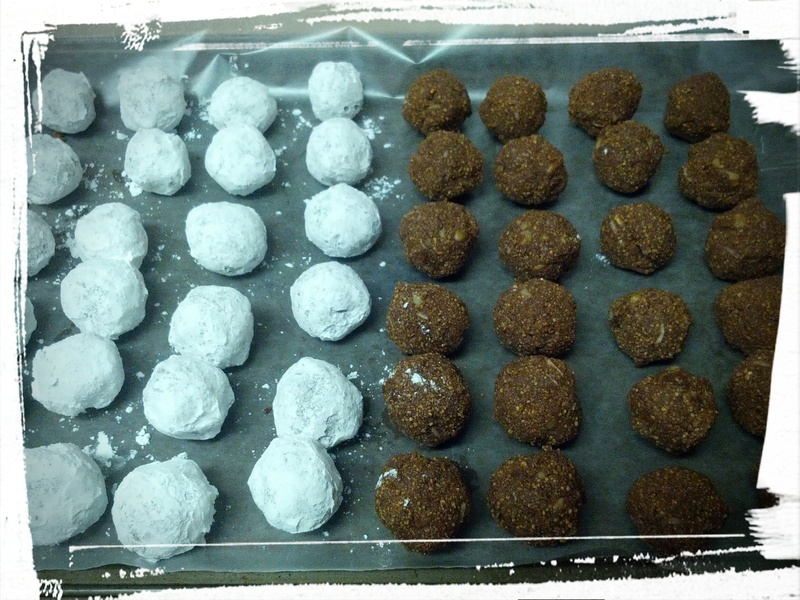 Ode to Rum Balls: Half and half/On a plate/Which one to Eat/Or should I say, ate. You’re supposed to let the rum balls ripen in a covered container for several days, but meh. I’ve tried one now (maaaybe two. Or three. ), and I like them! I’ve packed the remaining four dozen for the DH to take to work. As it’s just past midnight and he’s tucked cosily away in bed, I’ve left him a note saying that the rum balls are supposed to ripen, but that if he wants he can bring them to work tomorrow; I’ll let him decide. So if they aren’t as delicious as they’re supposed to be, it’ll be all his fault! Bwahahaha! Ah, the delights of marriage. Good times, good times. Next Post: Bulgur Salad, because I ate those rum balls. And all those granola bars. So it’s lettuce and bulgur for me! This entry was posted in Desserts Not Otherwise Categorized on January 16, 2015 by Margaret. Nutrient and calorie dense. Also delicious! As I’ve mentioned before, I’m part of an on-line baking group, cooking our way through Dorie Greenspan’s Baking Chez Moi cookbook. 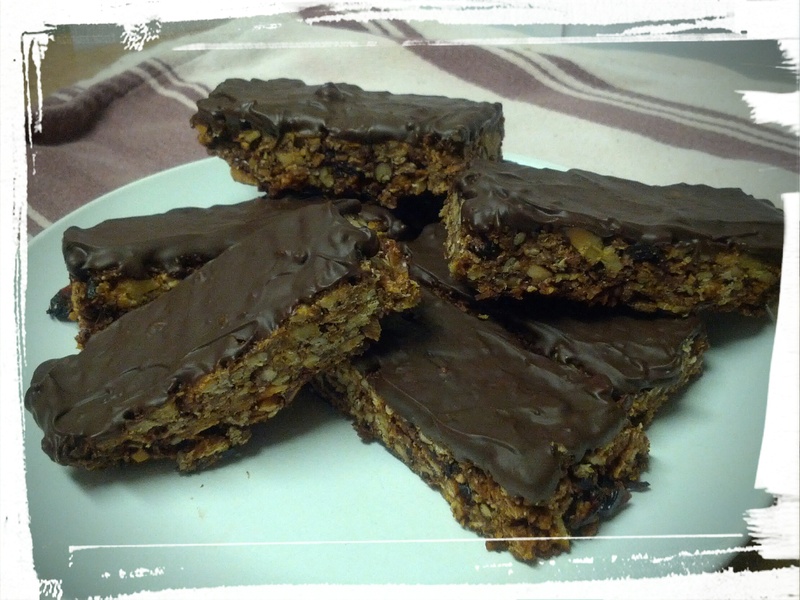 Today’s recipe is Granola Energy Bars. Hereafter christened Granola Extremely High Caloric Intake Energy Bars. Why? Read on, mes amis! 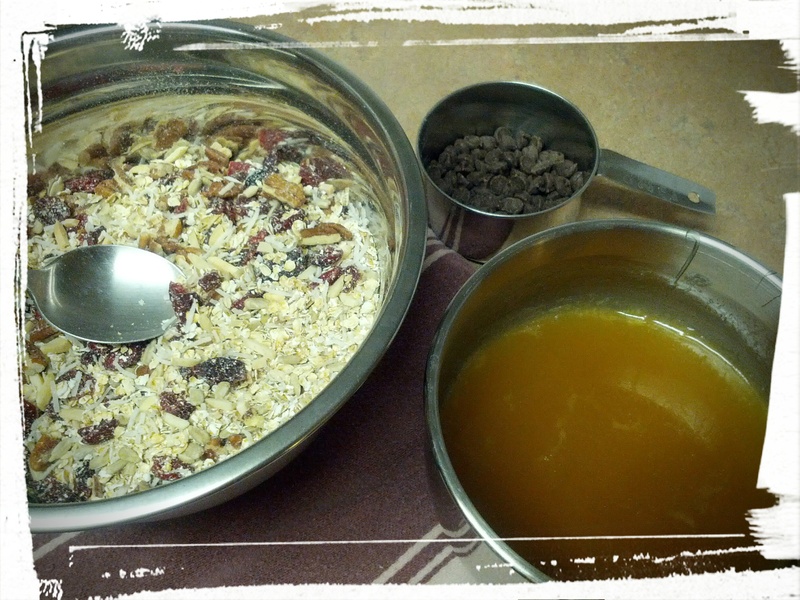 I started out using Dorie’s base of 2 cups of oats to 2 cups of dried fruit and nuts. And then I modified the recipe, because of course. Instead of pepitas (which I forgot to put on my shopping list and therefore did not have in the house), I just used more pecans. 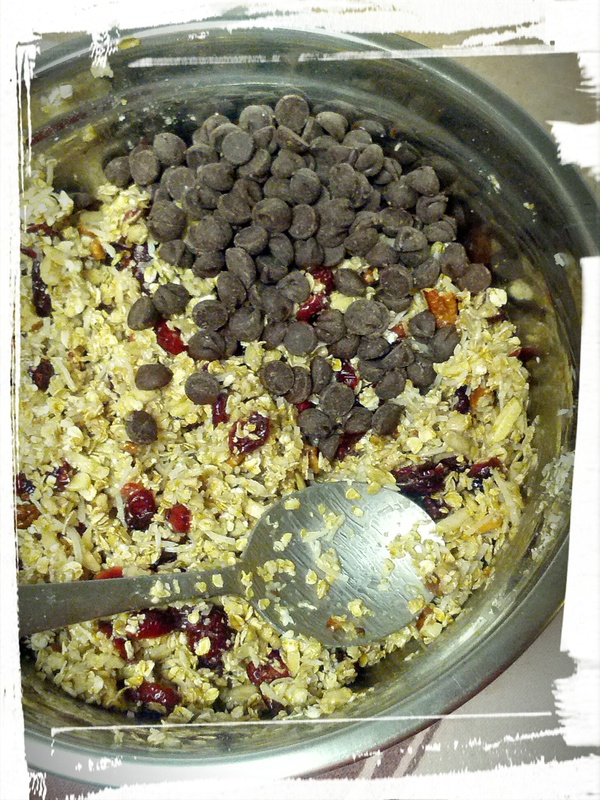 I used dried cranberries for the fruit, and then I used unsweetened shredded coconut to make it a tad healthier. I mean, you’re adding rice syrup — that should make it sweet enough! And then I mixed in a half cup of chocolate chips. Because sugar from chocolate does not count. Pre-mixing! The benefits of the oats and nuts cancel out the calories of the chocolate and rice syrup, right? I’m pretty sure that’s how it works. I had read on the Baking with Dorie group site, that others had tried adding chocolate chips, but that they had melted, so I thought I’d let the butter/syrup mixture cool before adding it to the granola. 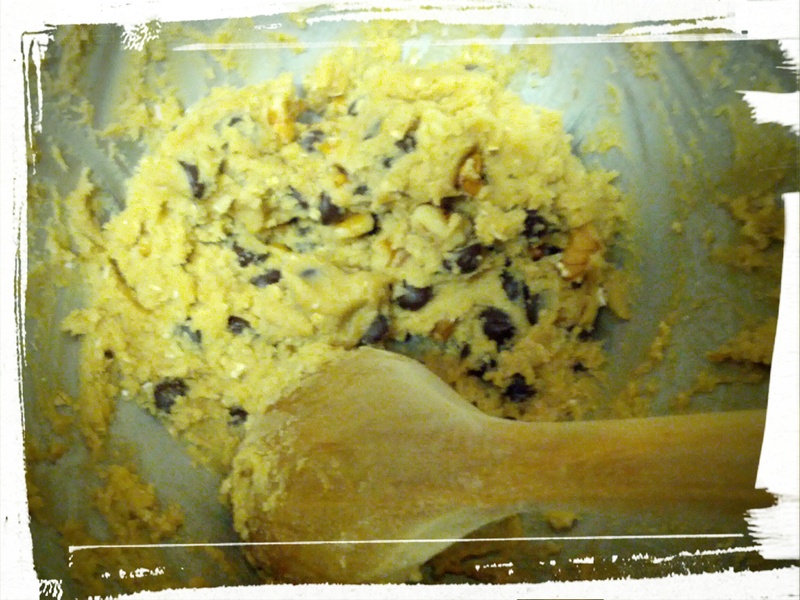 Then I mixed it all up before adding in the chocolate chips just before pressing the mixture into the pan. Did this work? Um, no. I should have let the granola cool after toasting it, but I didn’t, so the mixture turned into a melty, chocolate tinged-and-tasting bowl of yumminess. Melty chocolate? A serendipitious kitchen win for me! The chocolatey goodness, prior to melting. While I can’t give you the recipe, you can definitely check out the book from the public library. Or buy it! I’m definitely learning some new techniques while baking through this book, so despite my occasional frustration, it’s actually a good book. I can give you the brief gist of things though: toast, mix, bake, squish, cut, and eat. Er, squish? That’s right, squishing is integral to the…integrity…of the finished product. The batter/dough/granola-whatever-you-call-it, bakes up light and a tad airy, so you have to squish it all down with a spatula in order for it to stick together enough that you can cut it into bars when it’s cooled. Chocolate makes everything better. It also hides a multitude of (slightly burned) sins. I calculated the calories in each of these bars. Are you ready for this? 365 calories in each leeetle bar. At least in my version of them. They might be choc-a-block full of nutrients, but they’re not a diet food! The DH and I are trying to eat healthier this season, which means lots of salad. (I do like my salad.) It also means that I’m trying to cut down on the amount of baking that I do. These high-energy bars will have to last me for two weeks. Do you think it’s possible, given my love of midnight snacking? Just thinking about the lack of snacking makes me want to eat another bar. 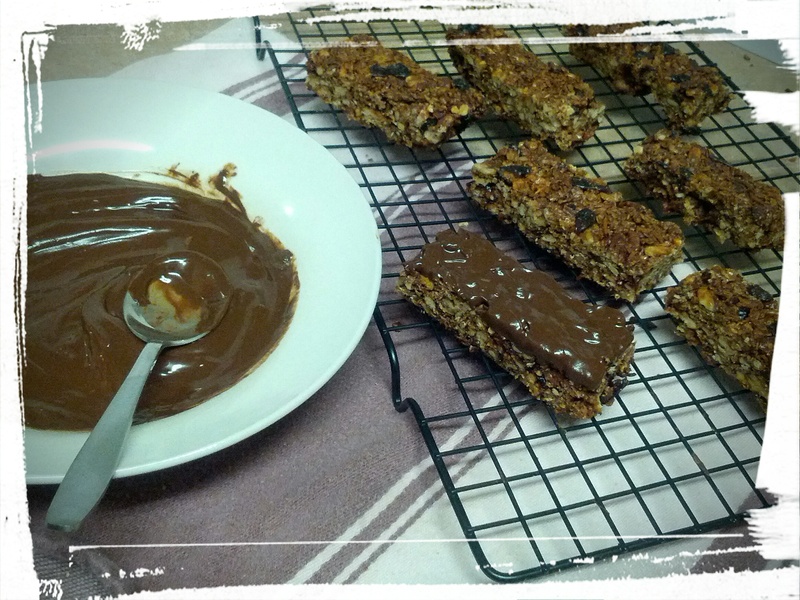 So if you’ll excuse me, off I go to nibble on a chocolate-infused granola bar! Next Post: Rum balls. So much for healthy! Followed by bulgur salad, repentantly. This entry was posted in Cook-a-Longs R Us, Snacks on January 13, 2015 by Margaret.